Tiger Woods was arrested early Monday on a DUI charge in Jupiter, Florida, and spent nearly four hours in a county jail before he was released. 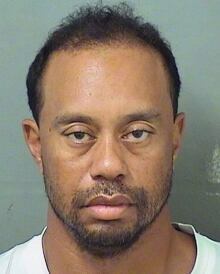 Tiger Woods on Monday after his arrest. Jail records show that the 41-year-old golf great was booked into Palm Beach County jail at 7:18 a.m. and released on his own recognizance at 10:50 a.m.
Notah Begay, a roommate of Woods when they played at Stanford, could relate. Begay was arrested for aggravated drunken driving in 2000 when he ran into a car outside a bar in New Mexico. He was sentenced to 364 days in jail, with all but seven days suspended. "It's embarrassing for Tiger, something that you can't go back and change," Begay said on Golf Channel from the NCAA men's golf championship, where he was working for the network. "I've been there myself. ... But it was a turning point in my life. Hopefully, it's something he'll learn from, grow from, take responsibility for and use it to make some changes."